The Battle of Paoli (also known as the Battle of Paoli Tavern or the Paoli Massacre) was a battle in the Philadelphia campaign of the American Revolutionary War fought on September 21, 1777 in the area surrounding present-day Malvern, Pennsylvania. Following the American retreats at the Battle of Brandywine and the Battle of the Clouds, George Washington left a force under the command of Brigadier General Anthony Wayne behind in order to monitor and harass the British as they prepared to move on the revolutionary capital of Philadelphia. 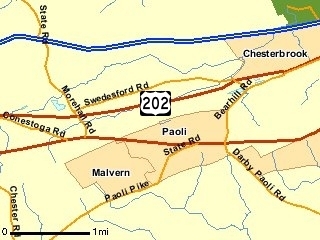 On the evening of September 20, British forces under the command of Major General Charles Grey led a surprise attack on Wayne's encampment near the Paoli Tavern. Although there were relatively few American casualties, claims were made that the British took no prisoners and granted no quarter, and the engagement became known (from an American perspective) as the "Paoli Massacre." On September 20, during the night, Gen. Howe dispatched Maj. Gen. Grey to deal with Wayne’s division. Grey left with his force at 10:00 P.M.and marched down the Moores Hall Road to the Admiral Warren cross-roads. As the leading British light infantry approached the junction, shots were fired by an American picket. It is said that these shots alerted the Pennsylvanian camp which lay behind woods to the South of the junction. The British forced the blacksmith, whose smithy lay by the Adm. Warren, to act as guide. The first wave of British troops, comprising the 2nd Battalion of Light Infantry, rushed through the woods and attacked the American camp. The Light Infantry were followed by the 44th Foot and, in a third wave, by the 42nd Highlanders. A small group of 16th Light Dragoons accompanied the Light Infantry. At Grey’s direction, the flints had been removed from his men’s muskets to ensure that no shots gave prior warning to the Americans. The attack was to be at the point of the bayonet. Grey thereby acquired the nickname of “No Flints” Grey. In the face of the British charge, the Pennsylvania troops were dispersed and driven out of the camp to the West, many through a gap in a fence along the edge of the encampment. Groups of British soldiers mixed with the Americans and confused fighting continued as far as the White Horse Tavern. Smallwood’s force approached from the West as the attack was coming to an end and came under attack as it passed the White Horse Tavern. The inexperienced and badly organized Maryland Militia dissolved in confusion. The Battle of Paoli was a severe humiliation for the Pennsylvania Continental troops but probably little more. 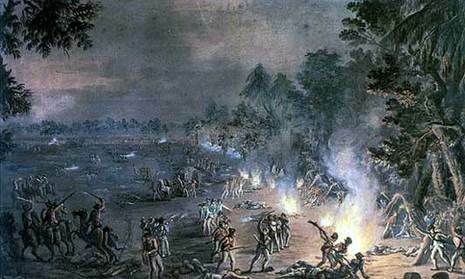 The fight is referred to as the "Paoli Massacre". It is difficult to see how that label can be justified in the light of the small number of American fatalities. Claims are made that the British took no prisoners. This allegation appears frequently in the Revolutionary War and is made against both sides. The accusation was made against Wayne that he allowed his camp to be surprised. At Wayne’s demand, he was subject to a court martial which exonerated him of this allegation. Whether Wayne was taken unawares or not the attack was well executed and highly successful, enabling Howe to take Philadelphia within a few days with little further resistance from the main American army under George Washington. Following the battle, the Americans vowed to take vengeance on the British Light Infantry. The light companies of the 49th and 46th Foot are said to have dyed their hat feathers red as a gesture of defiance and so that the Americans could identify them. The Royal Berkshire Regiment, of which the 49th became the 1st Battalion, continued the tradition of wearing a piece of red cloth behind their cap badges. Following a defeat at Brandywine Creek and a later, indecisive engagement shortened by rain, George Washington led the bulk of his army to Reading Furnace in Pennsylvania for new ammunition supplies. Anthony Wayne was left behind with a regiment at Paoli to harass British forces under William Howe. The main British camp lay at Tredyffin, where preparations were underway for a final push into Philadelphia. However, word was received that Wayne was in the area and the decision was made to ambush that force before moving against the American capital. Major General Lord Charles Grey did all he could to ensure a complete surprise of the encamped Americans. He would later be remembered as “No Flint Grey” because he ordered his soldiers to remove the flints from their muskets prior to battle. That directive assured that no accidental discharge of weapons would occur, but also it presupposed the use of bayonets in the attack. Shortly after midnight on September 21, a force of 5,000 British troops descended upon 1,500 Americans, most of whom were sleeping. An advance force of the attackers had managed to pass the American sentries by uttering a secret password extracted from a local blacksmith. Wayne’s camp was quickly overrun; the tents were set on fire and many soldiers were bayoneted as they slept. Wayne was eventually able to rally his troops and form an orderly retreat, succeeding even in saving their cannon. The Americans headed for temporary safety in West Chester after suffering 53 soldiers killed and more than 100 wounded. The event quickly became known as the Paoli “Massacre” — a term clearly intended to arouse revulsion in the minds of American patriots, many of whom viewed the bayonet as barbaric. A formal review of Wayne’s actions determined that he had committed tactical errors at Paoli. The general was angered by that finding; he demanded and received a full court-martial. That body reprized the matter and acquitted Wayne with honor. Following the attack at Paoli, the door to Philadelphia was unguarded. Howe and his forces entered the American capital on September 26.